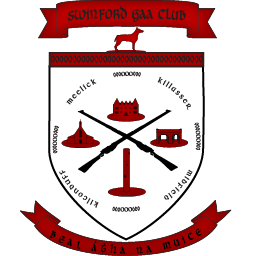 The gala Swinford GAA dinner dance was held on Easter Sunday night in Julians of Midfield. It was a fantastic night! The wonderful food was provided by club sponsor Sean Julian & Treanlar Catering. Musical entertainment was provided by local hot talent, Everyday Solution and DJ High Flyer Jonnie Pidgeon. Guest of honour was Mayo great, David Heaney. Our victorious county champions, the senior team, were presented with the Michael Walsh County Cup for 2012. The Juniors were also formally awarded their East Mayo medals. The u16 team of 1993 were commemorated in honour of the County A championship success of that year. It was great to get that squad back together! In the player awards we had the unprecedented event of one family taking both senior awards when Joe Kelly was named senior player of the year and his brother John Gerard was proudly named Junior player of the year. A great night for the Kellys! In other awards, Steven McNicholas was deservedly named Young Player of the year. Aiden Horkan entered the Hall of Fame. And the incomparable Marty Roughneen was deservedly named Clubman of the year. A big thanks goes out to the Social Committee who went to great lengths to ensure the night was such a success. Led by Rita Campbell, Billy McNicholas and Douglas Kelly, their efforts were greatly appreciated by all.